In French, "Le Mélange" means "The Mixture" and that's what you'll find as you browse through our online store. 16 oz. 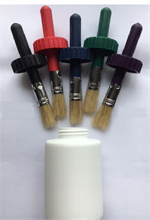 (Pint) White HDPE Container with Black, Green, Dark Blue, Dark Purple, or Red Cap and Attached Natural Bristle Brush (45/400) with FREE cap liner included. 2 oz. 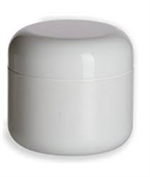 White Double Wall Jar with White Lined Screw On Dome Lid (58/400). SOLD BY FULL CASE ONLY (384 Jars and Lids). 3 oz. White HDPE Plastic Roll On Deodorant Type Bottle. Price includes bottle, cap and roll on ball. 35 mm Cap. Not refillable. 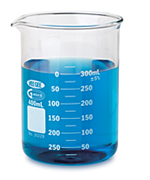 Measuring Cup, Clear; 30 ml (1 oz.) with graduated markings 1 - 30 ml. Our Beeswax pellets are the finest, cosmetic grade quality you can buy. 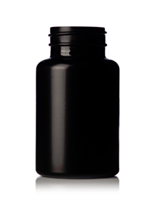 Can be used in lip balms and body care products. Small, flat pellets...very easy to work with. 6.6 Lb/3000 grams Nutritional Scale. Calorie Counter and More. The Cibo digital nutritional scale is a scale with a smart weighing system inside. 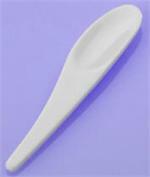 Curved Medium White Scoop Spatula, Polystyrene (50 per bag). 2 3/4" Long. 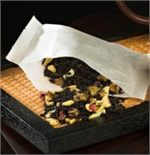 Our large heat and seal tea bags are super easy to seal with a hot iron and can be used for whole pots of tea, bath bags, potpourri bags, etc. Bags can be cut into small sizes or shapes! Outside bag dimensions are: 5 1/4" X 3 7/8". Testing strips assure the proper pH balance in all your finished body care products. Very easy to use...no guesswork - just match the color on the strip (in .5 increments) to the color on the chart to find the pH. 4" x 4" to 6" x 15" sizes. 2 mil. thick clear line single zip lock type bags: Unique zipper opens easily from the outside while contents are locked in.